Fixing a problem related to Electricity is very dangerous and must be preformed by a person who has experience and knows how to do it. This is a good reason to leave your problems to one of our electrical contractor in Chicago and take a burden of your hands. Our experts are professionals with years of fixing electrical systems behind them, so they are sure to understand your needs. Whether your problem is of a Commercial or a residential nature our electricians at Alltown Electric Inc will be there to help. Why Choose us for your Chicago IL electrical contractor? We Respect Your Investment – Our electrical services company believes in the old fashion values of honesty and integrity. Our electricians will always provide you with a written agreement before we start any electrical repairs or electrical projects. We maintain continual communication with our customers throughout entire projects (large or small) to make sure there are never any surprises. We Respect Your Business – Alltown Electric Inc knows that you have choices; we respect your business and will always do the job right the first time. Our electricians never cut corners and always use high grade materials. Ultimately your electrical safety is our biggest concern. We want to build relationships with our customers and provide them a safe and trustworthy business to turn to whenever they have an electrical need. Do you have an electrical problem: flickering lights, blown fuses, broken outlets, short circuits, faulty wiring, defective lights, code violations, damaged splices, complex fixture or ceiling fan installation? Electrical troubleshooting is not a job for a handy man, it takes a foundational understanding of electricity along with practice and experience to troubleshoot electrical problems. If it’s not handled correctly it could even be hazardous. Alltown Electric Inc actually specializes in troubleshooting electrical problems. At the company every electrician in Chicago has years of experience and will work with you to solve your electrical problem correctly and safely. 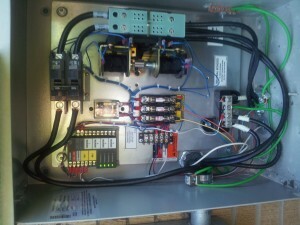 Contact one of our electrical contractor in Chicago IL for all your electrical needs.